Our baby is 9 months old. Wow! Can't believe it. There's so much to look forward to, and so much I will miss. 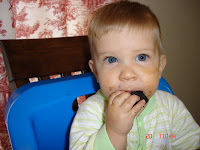 These are pics of him eating his first oreo cookie. 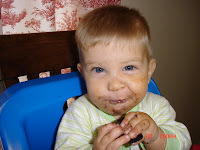 He's a messy eater, just like his bro (and nothing like his sis). He doesn't inhale food like Owen did, but he can definitely eat his fair share. Today, he ate 2 biscuits with gravy for breakfast and a whole slice of pizza for dinner (not the healthiest meals, but it's Sunday, and we rest!). He looks so much like his Daddy's side of the family. Scott says he sees his uncles all over Jace's eyes. He crawls everywhere he wants to go, and wants desperately to climb the stairs. He doesn't like to cuddle or love much, but his favorite place to be is still in my arms. I don't mind. When Rana was 9 months, I began thinking about our next baby. Today, I found myself thinking about our next, and confirming that it shouldn't happen. There is so much I would miss out on. Namely, sleep, sanity and a life! We wouldn't be able to foster again either. So, I'm gonna enjoy the mess out of this little guy. He's a great third kid, and SO STINKIN' CUTE! Thanks for watching my Monster last night. I loved seeing her in those heels. 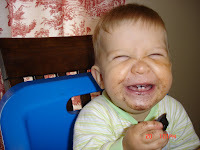 My Munchkin is an eater, too. Good thing baby cereal is cheap. I agree that he is stinkin cute! I'm sure he's alot of fun. Oh he is precious...he and Abby would be great friends! Love to pics girl! Miss you so much. Adorable! Good for you- putting perspective on having more. :-) Does that mean Scott is shopping for "Doctors"? Chris knows a good one! Ha! I love the Sunday menu! I can not believe he is 9mo old. What happened to our infants?